This is one of my favorite kinds of books--an Adult for YA novel. It's not written from YAs, it's written for adults, BUT because so many YAs are introduced to Shelley's Frankenstein in high school English classes, it's a great "what to read next" title. This isn't a "re-write" it's a continuation of the story we already know. Where Mary Shelley leaves off, Planisek picks up, answering the what if questions. It's impressive, to say the least. The writing is wonderful. 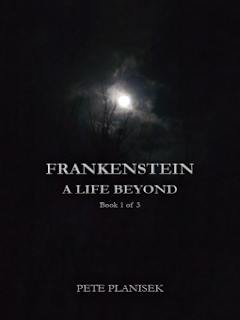 Planisek doesn't alter the original Frankenstein mythos and history. Instead, he weaves it into the story he needs to tell. It's not slow, it moves and draws the reader in, just like Shelley's work. The "flashbacks" are a bit long in some places, but gave a small break in the "present day" action. The creature (the monster) receives the same treatment from Planisek as he did from Shelley...which can't have been easy. Honestly, reading this book is like reading the story Mary Shelley would've told--and it's wonderful. This is book one of a trilogy...and I can't wait for the second installment. Disclosure of Material Connection: I received this ebook galley from Enceladus Literary LLC through the netGalley publisher/reader connection program. I was not required to write a positive review. The opinions I have expressed are my own.